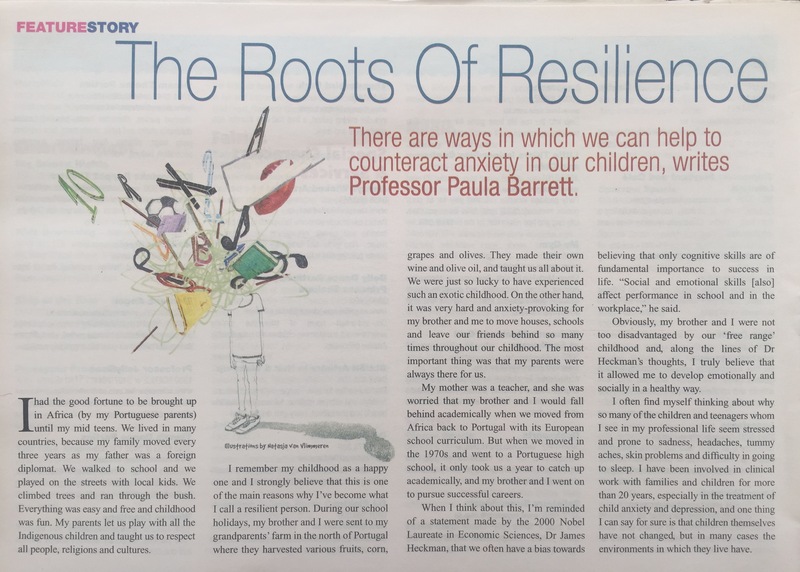 This is an extract from “Brisbane’s Child” magazine called “The Roots of Resilience” and it is about how children will always face challenging situations and also children anxiety, as well as reminding them that all their feelings are okay. The programs developed by Dr Paula Barrett are shown as a way to help them through this process. “I had the good fortune to be brought up in Africa (by my Portuguese parents) until my mid teens. We lived in many countries, because my family moved every three years as my father was a foreign diplomat. We walked to school and we played on the streets with local kids. We climbed trees and ran through the bush. Everything was easy and free and childhood was fun. My parents let us play with all the Indigenous children and taught us to respect all people, religions and cultures. I remember my childhood as a happy one and I strongly believe that this is one of the main reasons why I’ve become what I call a resilient person. During our school holidays, my brother and I were sent to my grandparents’ farm in the north of Portugal where they harvested various fruits, corn, grapes and olives. They made their own wine and olive oil, and taught us all about it. We were just so lucky to have experienced such an exotic childhood. On the other hand, it was very hard and anxiety-provoking for my brother and me to move houses, schools and leave our friends behind so many times throughout our childhood. The most important thing was that my parents were always there for us. My mother was a teacher, and she was worried that my brother and I would fall behind academically when we moved from Africa back to Portugal with its European school curriculum. But when we moved in the 1970s and went to a Portuguese high school, it only took us a year to catch up academically, and my brother and I went on to pursue successful careers. When I think about this, I’m reminded of a statement made by the 2000 Nobel Laureate in Economic Sciences, Dr James Heckman, that we often have a bias towards believing that only cognitive skills are of fundamental importance to success in life. “Social and emotional skills [also] affect performance in school and in the workplace,” he said. 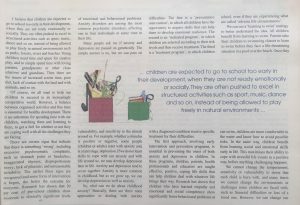 Obviously, my brother and I were not too disadvantaged by our ‘free range’ childhood and, along the lines of Dr Heckman’s thoughts, I truly believe that it allowed me to develop emotionally and socially in a healthy way. I often find myself thinking about why so many of the children and teenagers whom I see in my professional life seem stressed and prone to sadness, headaches, tummy aches, skin problems and difficulty in going to sleep. 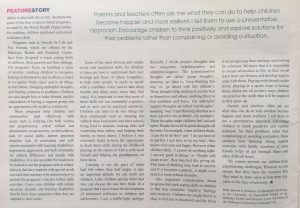 I have been involved in clinical work with families and children for more than 20 years, especially in the treatment of child anxiety and depression, and one thing I can say for sure is that children themselves have not changed, but in many cases the environments in which they live have. I believe that children are expected to go to school too early in their development, when they are not ready emotionally or socially. They are often pushed to excel in structured activities such as sport, music, dance and so on, instead of being allowed to play freely in natural environments such as parks, forests, rivers and beaches. Young children need time and space for creative play, and to simply spend time with loving parents, grandparents or other close relatives and guardians. Then there are the issues of increased screen time, poor diet, lack of contact with the land and with animals, and so on. Of course, we all want to help our children to succeed in an increasingly competitive world. However, a balance between organised activities and free time is essential for healthy development. There is no substitute for spending time with our children, watching them and listening to them, to get a feel for whether or not they are coping well with all the challenges they are facing. There are certain signs that indicate that there is something ‘wrong’, including excessive psychosomatic complaints, such as stomach pains or headaches; exaggerated shyness; disproportionate worry; lack of pleasure; and unreasonable irritability. The earlier these signs are recognised and some form of intervention is begun, the better the outcome for everyone. Research has shown that 20 per cent of pre-school children show moderate to clinically significant levels of emotional and behavioural problems. Anxiety disorders are among the most common psychiatric disorders, affecting one in four individuals at some time in their life. Many people ask me if anxiety and depression are passed on genetically. The simple answer is no, but we can pass on vulnerability, and sensitivity to the stimuli around us. For example, whether a stimulus is positive or negative, some people (children or adults) react with anxiety and, at a later stage, depression. If we do not learn skills to cope with our anxiety and with life around us, we may develop depression later in life. Anxiety and depression tend to occur together. Anxiety is more common in childhood, but as we grow up, we can develop depression as well as anxiety. So, what can we do about childhood anxiety? Basically, there are three main approaches to dealing with anxiety difficulties. The first is a ‘preventative intervention’, in which all children have the opportunity to acquire skills that can help them to develop emotional resilience. The second is an ‘indicated program’, in which children are selected according to their risk levels and then receive treatment. The third is a ‘treatment program’, in which children with a diagnosed condition receive specific treatment for their difficulties. 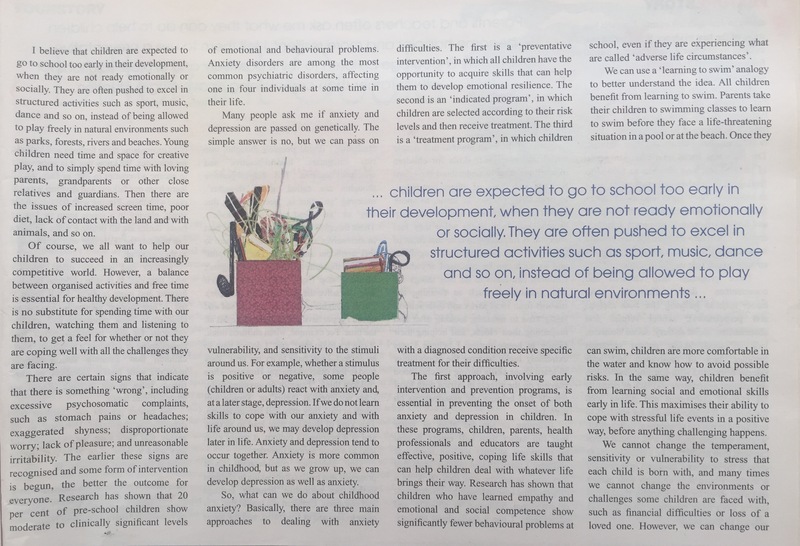 The first approach, involving early intervention and prevention programs, is essential in preventing the onset of both anxiety and depression in children. In these programs, children, parents, health professionals and educators are taught effective, positive, coping life skills that can help children deal with whatever life brings their way. Research has shown that children who have learned empathy and emotional and social competence show significantly fewer behavioural problems at school, even if they are experiencing what are called ‘adverse life circumstances’. We can use a ‘learning to swim’ analogy to better understand the idea. All children benefit from learning to swim. Parents take their children to swimming classes to learn to swim before they face a life-threatening situation in a pool or at the beach. Once they can swim, children are more comfortable in the water and know how to avoid possible risks. In the same way, children benefit from learning social and emotional skills early in life. This maximises their ability to cope with stressful life events in a positive way, before anything challenging happens. We cannot change the temperament, sensitivity or vulnerability to stress that each child is born with, and many times we cannot change the environments or challenges some children are faced with, such as financial difficulties or loss of a loved one. However, we can change our ability to deal with life events. Australia has some of the best evidence-based programs, as rated by the World Health Organization, for teaching children emotional and social resilience skills. Programs such as Friends for Life and Fun Friends (…) have been designed to teach coping skills to children, their parents and their siblings. The programs focus on building a sense of identity, teaching children to recognise feelings in themselves and in others, to learn to recognise ‘body signs’ and to do things to feel better, changing unhelpful thoughts, and finding solutions to problems. Children are also taught how to make friends, and the importance of having a support group and an appropriate role model is reinforced. These programs help children and communities deal effectively with issues such as bullying (for both victims and perpetrators); school refusal and absenteeism; social anxiety; social isolation; lack of social skills; autism spectrum disorder; lack of motivation and self-esteem associated with learning disabilities; depression; aggression; and lack of empathy for cultural differences and people with disabilities. It is also possible for teachers to be trained to run the programs at their school. Schools that have students with special needs can send their teachers to be trained in how to include the programs’ concepts in their daily activities. I have seen children with autism spectrum disorder and learning disabilities benefit from these programs when they are adapted to their needs. Some of the most obvious and simple social and emotional skills for children to learn are how to understand their own feelings and those of others (empathy), to help other people, to smile, to speak with a confident voice, and to take deep breaths and drink water when they feel angry. It is important to note that most of these skills are not essentially cognitive, and as such can be practised anywhere. Children can learn to do nice things for their community such as cleaning the rubbish from local parks and their school, being kind to animals, looking after and respecting their elders, and helping their family in house duties. I believe I was extremely lucky to have the opportunity to learn those skills during my childhood playing on the streets in Africa with local friends and helping my grandparents on their farm. Learning to see the glass of water half full rather than half empty is also an important attitude we can teach our children. Little children quickly learn that they can choose the way they think. In a program that I use to foster the development of emotional resilience in children and adolescents, I use a traffic-light analogy. Basically, I divide people’s thoughts into two categories: helpful/positive and unhelpful/negative. The helpful/positive thoughts are called ‘green thoughts’, meaning ‘go’ (that is, ‘keep thinking this way’ or ‘go ahead with this attitude’). These thoughts help children to see the best in themselves and others, enabling them to feel confident and brave. The unhelpful/ negative thoughts are called ‘red thoughts’, meaning ‘stop’ (`quit thinking like that as it does not solve the problem’, for example). These thoughts make children feel sad and upset. People have red or green thoughts all the time. 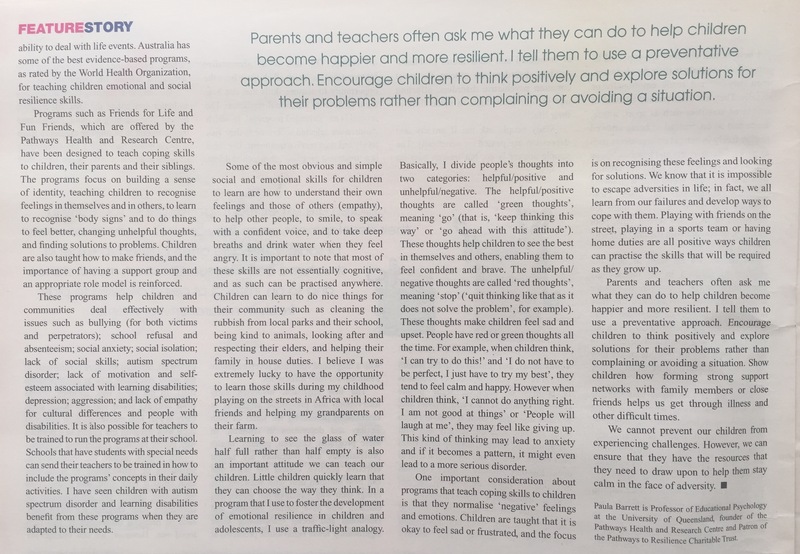 For example, when children think, `I can try to do this!’ and ‘I do not have to be perfect, I just have to try my best’, they tend to feel calm and happy. However when children think, ‘I cannot do anything right. I am not good at things’ or ‘People will laugh at me’, they may feel like giving up. This kind of thinking may lead to anxiety and if it becomes a pattern, it might even lead to a more serious disorder. One important consideration about programs that teach coping skills to children is that they normalise ‘negative’ feelings and emotions. Children are taught that it is okay to feel sad or frustrated, and the focus is on recognising these feelings and looking for solutions. We know that it is impossible to escape adversities in life; in fact, we all learn from our failures and develop ways to cope with them. Playing with friends on the street, playing in a sports team or having home duties are all positive ways children can practise the skills that will be required as they grow up. Parents and teachers often ask me what they can do to help children become happier and more resilient. I tell them to use a preventative approach. Encourage children to think positively and explore solutions for their problems rather than complaining or avoiding a situation. Show children how forming strong support networks with family members or close friends helps us get through illness and other difficult times. 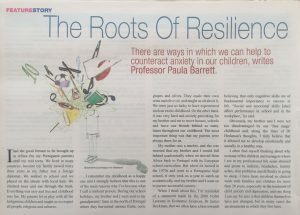 Paula Barren is Professor of Educational Psychology at the University of Queensland, (…) and Patron of the Pathways to Resilience Charitable Trust.